Creating a secure and relaxing environment for your dog while they are crated is important. The Carlson Extra Large Double Door Dog Crate does just that. The durable crate features two doors, one at the front and one at the side for easy access. While the multi-point locking system, secures your pet and provides owners with peace of mind. For added convenience, the portable nature of the dog crate, allows it to fold nearly flat for travel and storage. Perfect for extra-large breeds up to 36” long and up to 28” tall, the Double Door Dog Crate can be used from puppy to adult stage. 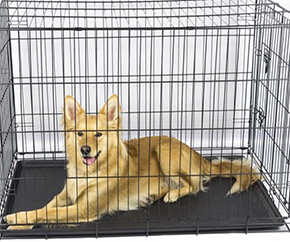 The steel wire frame of the Carlson Extra Large Double Door Dog Crate provides durability, while the multi-point locking system secures the crate. 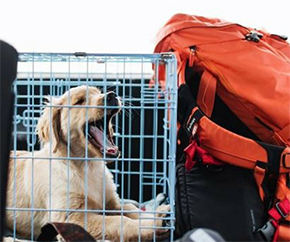 The collapsible dog crate, is easy to set up and break down allowing you to latch it tightly and carry wherever you may need. Measuring 48” L x 30” W x 33” H, the crate provides a comfortable environment for extra large sized breeds. If you’re using it to train a puppy, the wire crate features a removable bottom pan, so it’s easy to clean if accidents do occur. Having the front and side access doors, provide the crate with versatility and easy access to the inside of the crate. The Carlson Extra Large Double Door Dog Crate is backed by a manufacturer’s limited 90-day warranty. Carlson Pets Products are designed specifically for your pet to suit all breeds and lifestyles. Helping your dog adjust to quiet time in their crate is a good way to set boundaries. 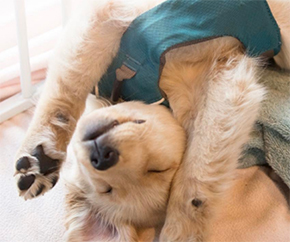 Whether a brand new owner or well-experience pet caretaker, consider some of these easy tips to keep your dog busy in their crate. Despite any horror stories you might have heard, crate training a dog can actually be fairly straightforward and rewarding process. Read on for a few tips to get you started on the right foot. It can be hard to put a cute, little, puppy in their crate. But it is helpful. Here are a few reasons you shouldn’t feel bad about crate training your puppy.